LinkedIn Messenger – a tool that lets you contact colleagues, business partners and other professionals – now lets you display your corporate acumen through the medium of animated GIFs. Half of LinkedIn users can start sending Minions clips to their bosses today, and the rest will be able to join the fun in the coming weeks. The animations are provided though GIF tool Tenor , which Google bought in March to boost its image search. "Most people now use Google Images to find more information about a topic, and to help them communicate and express themselves – case in point, we see millions of searches for GIFs every day," the company said in a press release. Despite this, Tenor still works as a separate brand and Google has no problem with it working with rival tech giants, including Facebook, Baidu, Apple and now (through LinkedIn) Microsoft. 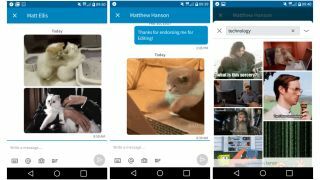 Adding GIFs to LinkedIn might seem strange move – they're hugely popular in messaging apps, but their value in a business setting seems pretty limited. However, there is a sensible explanation. Tenor analyzes the type of images its users are sharing on social media platforms, and uses that information to display 'sponsored' GIFs from advertisers. Tenor charges the advertisers when their GIFs are shared, and splits the cash with the media company – in this case, Microsoft. Whether people will actually want to send Spongebob clips to their bosses remains to be seen. If you're thinking of trying it right now, take care – once you've chosen a contact, tapping a GIF will send it to that person immediately, with no option to cancel, confirm, or even explain it. Not that HR will believe you.